Types of Metal Roofs - Performance Roofing, Inc.Performance Roofing, Inc. 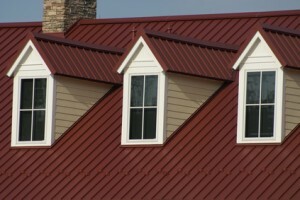 There are a number of different types and styles of metal roofing products available. All are durable and offer superior protection from the rain, snow, ice, wind and other weather conditions we experience along the Seacoast area. The choice you make in materials will likely be based on appearance and cost, as some specialized metal roof products demand a higher price. Standing seam is the most popular style of metal roofing, and has been around for hundreds of years, when metal roofs were made of tin or copper. This is the type of metal roofing system that Performance Roofing recommends for our region. Most standing seam metal roofs installed today are 24 gauge steel panels with high quality Kynar 500 paint coating. The most common profiles of standing seam roofs are 16″ panels, connected with either a snap-lock or mechanical lock. Snap lock allows the metal roofing contractors to quickly install the roof by snapping one panel into receiving the lock of the previous panel. Standing seam metal roofs provide the best value in metal roofing, delivering an exceptionally long service life with little maintenance. Stone coated roofs begin with underlying metal panels that have a stone-like coating bonded to the exterior surface. This can create an attractive look similar to natural tile or traditional asphalt shingles, but with a longer service life. Stone coated metal roofs are among the most expensive options in metal roofing. Aluminum is extremely lightweight and won’t rust, but must be painted or coated. Coatings are similar to those used on steel. Aluminum’s natural properties of light weight, strength and longevity make it a desirable roofing material particularly for reroofing where structural reinforcement is not possible or desired. Metal shingle roofing offers the longevity and durability of steel with the look of asphalt shingles. The metal shingles are available with either stone or Kynar coating. Metal shingles require more labor for installation and thus are more expensive than standing seam panels. A corrugated panel metal roof is most common in low-level commercial structures such as barns, warehouses and outbuildings, and is not recommended for residential use. If you want to step up to a rugged, durable metal roof, or if you are interested in a high quality shingle roof, make the call to the roofing contractors Portland and Portsmouth homeowners rely on to protect their homes – Performance Roofing. Call us today at (207) 430-3868 to schedule a free roof inspection and written estimate for your Portsmouth or Portland roofing project or for roof repair Portland or roof repair Portsmouth. We offer metal roofing services in York, ME, New Hampshire, NE, Dover, Portsmouth, Hampton, NH and other surrounding areas. For more information, click here.